These trails are only a few of the many, varied hiking, cycling and equestrian experiences you can enjoy in the Angeles National Forest. Table Mountain is unique and beautiful. 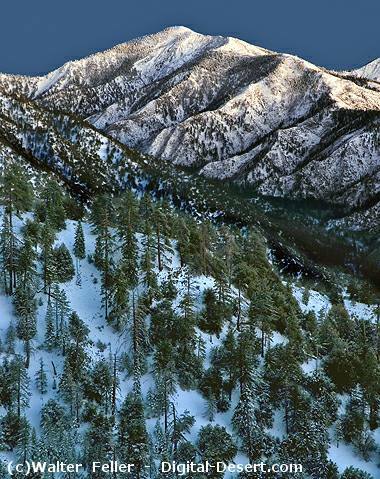 Dynamic views of the high desert including the peacefulness of the forest. Walk around the campground and enjoy this wonderful location. Trout fishing and canoeing along with some mighty fine picnic spots are highlighted in this tour of a small San Gabriel mountain lake. Rock formation along the San Andreas fault. Quite different from the nearby forest. Crossroads community and Ranger Station. To the millions of Los Angeles area residents who live within an hour"s drive and to visitors from all over the world, the Angeles National Forest provides a thousand square miles of open space and a variety of recreation opportunities year around. In contrast to the nearby city, the Angeles offers natural environments, spectacular scenery, developed campgrounds and picnic areas, swimming, fishing, and the solitude of quiet wilderness areas. Winding throughout the Forest are trails for hikers, equestrians, mountain bikers and off-highway vehicle enthusiasts.